A board certified veterinary specialist is a veterinarian with advanced training in a specific discipline in veterinary medicine. His or her knowledge and skills in this area have been evaluated and recognized by a specialty organization accredited by the American Veterinary Medical Association (AVMA). General practitioners recognize the need for specialization and refer clients for a second opinion on difficult and unusual cases. Animals are also referred when the veterinarian realizes the diagnosis and/or treatment requires instrumentation and experience that is not generally available. Veterinary specialists act as an extension of the general practitioners practice by allowing them to increase the scope of their practice and what they offer their clients. Specialization in veterinary medicine allows pets access to advanced care and treatments similar to what is available in human medicine. 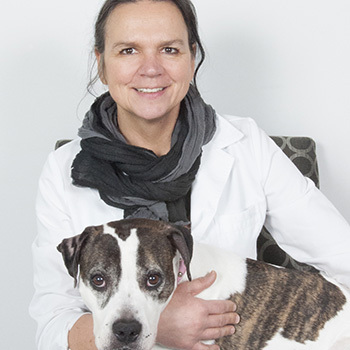 A veterinary dermatologist is a veterinarian board certified in veterinary dermatology and is enrolled to the American College of Veterinary Dermatologists (ACVD). Therefore, the veterinary dermatologist is a veterinarian with expertise in the diagnosis and treatment of animal skin, ear, hair, nail, hoof, and mouth disorders. Specifically, veterinary dermatologists have significant training and experience in the management of allergic skin diseases. Additionally, their professional background make veterinary dermatologists extremely qualified in recognizing and treating infectious skin diseases (e.g., bacterial, fungal, viral), parasitic skin diseases, dander-related skin disorders, alopecia (hair loss), congenital skin diseases, autoimmune skin diseases, benign and malignant skin cancer, hormonal-related skin diseases, and other internal (systemic) causes for skin abnormalities. Chronic infections and inflammatory conditions of the ears are generally related to skin disorders and veterinary dermatologists have familiarity in managing chronic ear disorders. Veterinary dermatologists can identify skin lesions/sores and the patterns they form on animals which aid in the selection of proper diagnostic procedures. Many specialized diagnostic procedures are used by veterinary dermatologists including, but not limited to skin cytology, skin scrapings, skin/ear cultures, skin testing, and skin biopsy. How can the veterinary dermatologist help you? Does your pet constantly lick, chew, bite, scratch, or shake their head? Is there hair loss, scabs, or dandruff? Do you notice a change in the skin or coat's color or texture? If your pet has any of these problems, you may look for a veterinary dermatologist near you.